In May 2014, Dr. Kalish Kedia graciously and generously offered to help the IAUA establish a new IAUA/Anupam Ted Kedia Research Scholar Endowment. This endowment fund provides $40,000 grants to MDs and PhDs for 1 to 2 year projects in urological research. Dr. Kalish Kedia graduated from medical school with Honors in Anatomy, Surgery, Opthalmology, Otolaryngology, and Obstetrics/Gynecology and completed his Urology residency training at the University of Minnesota. 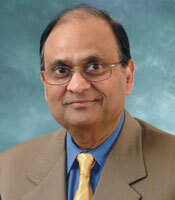 He has been Board Certified by the American Board of Urology since 1975. Dr. Kedia is the author of numerous Peer Reviewed Articles, recipient of major NIH grants to develop a male birth control pill, and has been listed in America’s Top Physicians Publication and Cleveland Magazine’s “Top Doctors”. Dr. Kedia is a past chief of Urology, Minneapolis Veterans Affairs (VA) Hospital, Metro General Hospital, Cleveland Ohio and past assistant professor of Urology, University of Minnesota and Case Western Reserve University. In addition, he has presented clinical and research papers in numerous national and international meetings. After spending nearly 12 years in academic practice of urology Dr. Kedia established Cleveland Urology Associates a private practice group along with his associates Dr. Jeffrey Lapeyrolerie and Dr. Robert Field (radiation oncologist). Together they also established Cleveland Urology Cancer Center providing comprehensive care to patients with urological malignancies. Besides being very active in his private practice Dr. Kedia also enjoys teaching residents and medical students. Dr. Kedia is proud to name this fund in memory of his son, Anupam Ted Kedia.